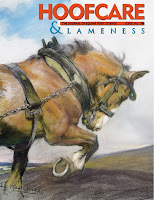 The US Trotting Association's magazine Hoof Beats has a feature on laminitis this month and the magazine sent a video crew to the veterinary hospital at The Ohio State University College of Veterinary Medicine in Columbus, Ohio to film a supporting video to accompany the article. I hope you will check out the article, and also watch these two short videos. The first features Ohio State's Dr. James Belknap, a respected leader in the study of the mechanism of the disease and of medications' effects. The article in Hoof Beats was written by Dr. Belknap. He obviously works in a hands-0n role at Ohio State, as well, and you'll see him giving some of his opinions about the clinical aspects of the disease. On the second clip, you'll see Dr. Belknap work on the foot of the patient, and then Ohio State farrier Trey Green goes to work and finds the case ideal for the applicaion of a heart-bar shoe. I wonder where and how the horse is now. Many thanks to the USTA for posting the video.